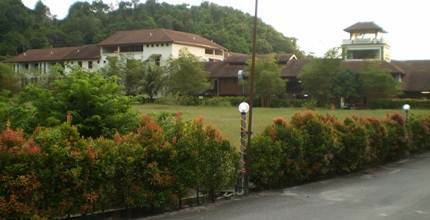 The Lanai is a 3-Star resort located in Pantai Tengah by the beach side and next to the Holiday Villa Resort. It's about 20 minutes walk from Pantai Cenang area. It has several units with 100 rooms and villas that are scattered across several acres of land area and having a beautiful large tropical pool at its center. Although the resort has a beach of its own, it would need a bit of walk from most units. There are no beach front rooms as such except for few villas that have clear sea views. There are two types of accommodations in Lanai. Deluxe Rooms and Villas. Villas are independent units and costlier. The rooms are spread in units which are either garden facing or pool facing. If you don't want to climb staircase, then choose rooms in the ground floor. There are no elevators. Another advantage with the ground floor rooms is they have French door opening out to a small patio which has chairs laid out to relax. It can be a great way to chill out in the evenings. The rooms have TV (not LCD), tea/coffee maker, attached bathroom, air conditioning, mini fridge and other standard furnishing. Although the rooms are not modern, they come with standard amenities as expected in such category of hotels. The beds are either Queen Size or two single beds. The Villas have either garden view or sea view. Each villa has two rooms with a Queen bed and two single beds, a family seating area and all other amenities as in rooms. The total size of a villa is over 700 sq ft. The sea facing ones have higher rates. Continental breakfast is served at the Yan Cafe between 7am to 10:30am. The breakfast usually includes eggs and noodles as well. The beach side restaurant (Tanjung Jaga Beach Cafe) serves both local and western cuisine. You will get lunch and dinner here. The restaurant is open until midnight. The front desk has lockers (free to guests) for keeping valuables. The resort offers laundry & ironing services, fax/photocopying, free wi-fi, free parking etc. They can also organize airport shuttle. There is also luggage storage facility. The large open swimming pool is surrounded by tropical trees offering a soothing experience. Various motorized and non-motorized water sports are available at the beach front. In fact the beach is great to lounge in the sun (lounging chairs with umbrellas provided) and to soak in the wonderful views of the sunset. Other recreational facilities include volley ball, cycling etc. Check in at 2pm; Check out at 12noon. 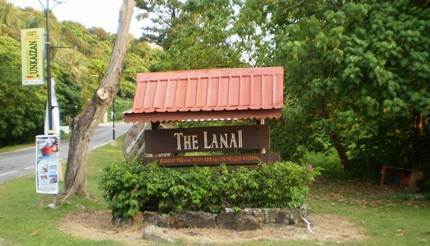 Lanai is overall a value for money hotel. The location is great... away from the crowd and noise yet not far away from the shops and restaurants. In fact there is a nice Indian restaurant and several utility shops very close by. Pantai Cenang is about 20 minutes walk and Kuah Town is only 20 minutes by taxi. There is a Taxi stand on the main road and getting taxi is not a problem. The large tropical pool is really nice. The private beach is great for sun bathing, reading books and watching the sunset. There is no concierge service which means that you will need to carry your own luggage. If you take a room in upper floor, it can be a it cumbersome. The hotel has not been modernized and lacking maintenance in some places. However it's clean and the facilities are standard. Due to many trees and plantations all around, there are problems with lizards. The breakfast is basic. However the offerings clearly mention that it's continental and that's all what can be expected.